It is always so much fun to make things for children. My 3 1/2 year old quadruplet grandbabies (and their 5 year old big brother) are always THRILLED with something new that Mamaw made for them. And, you know what – it doesn’t even matter if there might be little flaws in it, or if I was in such a hurry to finish the toy that a couple seams don’t line up properly. They always act like it’s the best thing they’ve ever gotten. What a way to “make” Mamaw’s day —- and I guess it makes their day too. Long story short — there are so many toddler toys that can be made and offered for sale in your customer waiting area – many of them using scraps that you already have, so the expense is minimal and profit margin much higher since all materials are already in your sewing room. I’ve found a couple of great ideas (with excellent tutorials) at Homemade By Jill that I want to pass along. 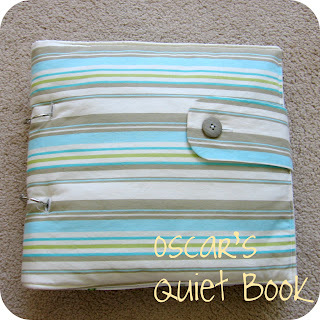 The first project that would be perfect for every little one is a “quiet book”. I love the way she’s used rings to put it together, so that additional pages can be added, or some that may get so worn that they need replacement can easily be replaced. Jill’s second toddler / baby toy that I want to pass along is something that I’d wanted to make for my grandbabies (they’re a little too old for them now, darn it!). The “tag animals” are really a perfect item for little ones, because it seems that they usually spend more time chewing on and playing with the tags on things than the item itself. I believe I would have put a couple more of the ribbon tags at the bottom, but wouldn’t this make a great plaything for the babies. You might even want to use some crinkle material on the inside – I can assure you this type of toy would be one of their favorites! Come to think about it — there aren’t too many more days left until Christmas (time flies, you know) – so you might want to get started on your toddler toys now so you’ll have a good supply of them in the customer waiting area in time for Christmas shopping, or have some available for your fall craft shows. Nursery Room Projects is a book that is filled with ideas for toddler / baby toys and items that can be made to go along with these two items. I would say, “get started early”, but actually every day is a great day to have toddler / baby toys available for the public!